Well, it’s now evident that the market chose 1988, not because that level is somehow magical, but because it represents a boundary between two different types of trading environments, just as 1935 represented a boundary. Above 1988 is a zone known here as lottery fever for its feverish buying of stocks that drives prices higher without regard for fundamentals, economic news, or anything else that otherwise might cause prices to decline. Below 1988 is a zone of digesting gains, named for its methodical, rational consideration of economic developments that causes stock prices to take one step back for every two steps forward. Although the S&P 500 closed a hair inside the lottery fever zone this past Friday, true lottery fever cannot be confirmed to have infected the stock market until the S&P has remained in that zone for at least a week. Every attempt to enter the lottery fever zone so far in 2014 has failed within a week. Therefore, if the S&P confirms lottery fever next week, it would likely indicate a major shift to bullishness, the likes of which have not been seen since 2013. The last confirmed case of lottery fever began November 17, 2013 and ended on January 19, 2014. During that 2-month period, the S&P added nearly 100 points, which is not all that impressive a move on its own, but certainly is impressive considering it was on top of a 100 point move it had already made in the previous 2-month period from last September to November. The following analysis is intended to help traders recognize and understand lottery fever, and thus avoid being unnecessarily frightened away from stocks just because indicators such as the RSI say stocks are overbought. This week’s profit was +2.9%. This week’s profit was +0.0%. It is important to note that lottery fever often cannot be confirmed until it has been in place for at least a week. Therefore, the coming week will likely either confirm (with S&P above 1985) or deny (with S&P below 1985) its presence. 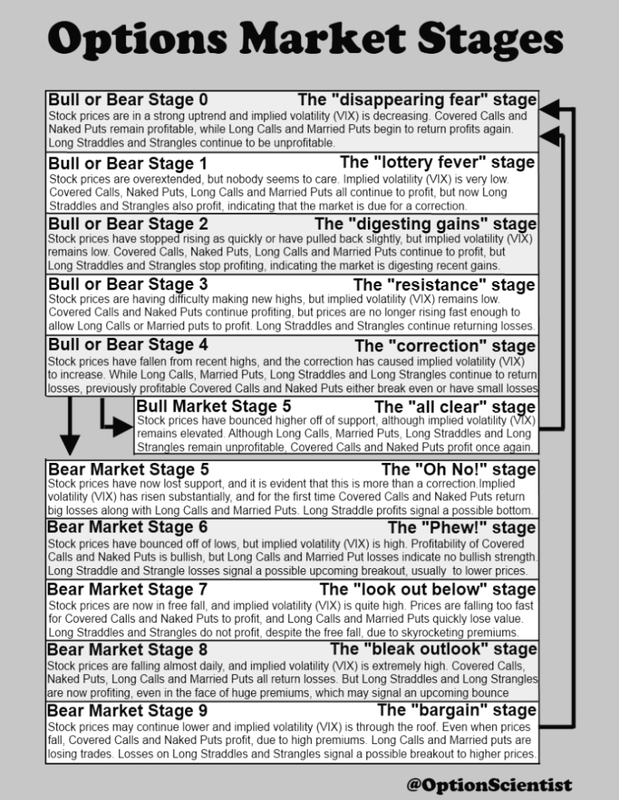 A chart describing all of the different Options Market Stages is available by clicking the link to the left to enlarge. The term overbought typically means that the price of a stock (or a basket of stocks such as the S&P 500) has gone too high to be sustainable. After all, there is no such thing as a stock literally being bought too much. There are only so many shares, just like any asset with limited supply. For example, real estate can become overbought, but it doesn’t literally mean that too many folks bought property; with the possible exception of those who own land on a volcano, the amount of real property doesn’t increase. Overbought simply means that too many folks tried to buy at the same time; and with so many buyers available, sellers took advantage of the opportunity to raise their asking prices. Overbought implies that prices will decline when the number of buyers returns to normal. But that’s not always the case. Not every increase in prices turns into a bubble that pops. Sometimes, conditions continue to appear overbought for an extended period of time, even when the volume of buyers declines. If prices declined every time an indicator such as the Relative Strength Index (RSI) reached an overbought range, such as 70 or higher, there would be little need for a trader to use any other indicators; one could trade the RSI and get rich. Obviously, there’s more to being a successful trader than selling stocks when they reach their 70 RSI levels. There is a reason the RSI works so perfectly at times, and other times fails miserably. That reason: the RSI, as is the case with many indicators, tracks changes in the stock not changes in the traders. Traders change. If it assumes changes in stock price correlate to changes in the traders of the stock. If traders undergo changes that do not correlate to the price of the stock. Traders often experience greed or fear that does not correlate directly with the price of stocks or the trend in stock prices. For example, traders may get actually get more greedy when prices seem overbought, not less greedy, as might be expected. Any indicator that fails to account for the increase in greed may perform poorly in such an environment. More than a simple change in emotions, the traders themselves can actually change. In an extreme example, traders who own stock now, near all-time highs for many companies, are likely not the same traders who owned stock a few years ago, after the financial crisis had driven stock prices to multi-year lows. While less extreme, a lot of traders who bought stocks at the beginning of August, when the S&P dipped near the 1900 level, are likely not the same traders buying stocks now, closer to the 2000 level. It takes a bullish trader to buy on a dip, it takes a really bullish trader to avoid the temptation to sell on the next rip, and it takes an irrational, greedy trader (or a highly- disciplined trend trader) to buy on the rip, after weeks of nothing but rips, even when that rip results in new all-time highs. Thus, it is important to account for the possibility of irrationality when using any indicator. If irrationality spreads like a fever, like lottery fever, stock prices can then rise no matter how overbought they appear. RSI 70 is simply not as effective an indicator when lottery fever is underway. Essentially, if the S&P rises above the 1980s level anytime soon (through the first week of September), many folks buying stocks will be ignoring many traditional overbought indicators such as the RSI. That’s what makes the lottery fever stage so important for trader’s to recognize. Lottery fever makes prices go higher just when indications are that “they can’t go any higher”. Lottery fever is irrational, and yet it infects the market occasionally; the whole market can and does become irrational at times. It may be helpful for a trader to consider who owns stock when lottery fever is underway. After all, stock is just a piece of paper (and in many cases just an electronic representation of a piece of paper); the stock itself doesn’t change much but the owners of the stock do change. 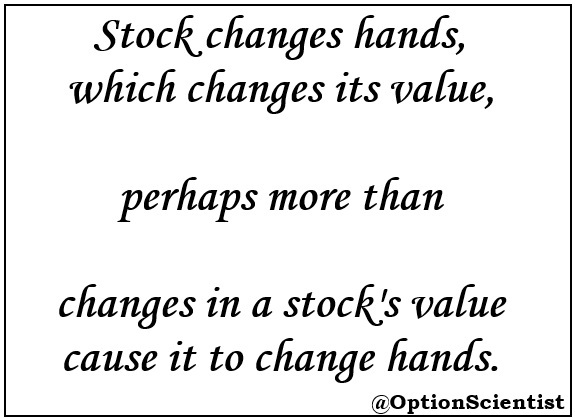 Stock changes hands, which changes the value of the stock, perhaps more than the fundamental value of the stock causes it to change hands. Who buys stocks when lottery fever is underway (when at-the-money (ATM) Long Straddle option trades are earning a profit)? Obviously, there is a limit to how high stock prices can go in a given period of time, no matter how irrational or insane the buying becomes. Over the next several weeks, the limit increases from approximately 2050 today to about 2100 by mid-September (green line in the chart above) and 2150 through much of October and November. 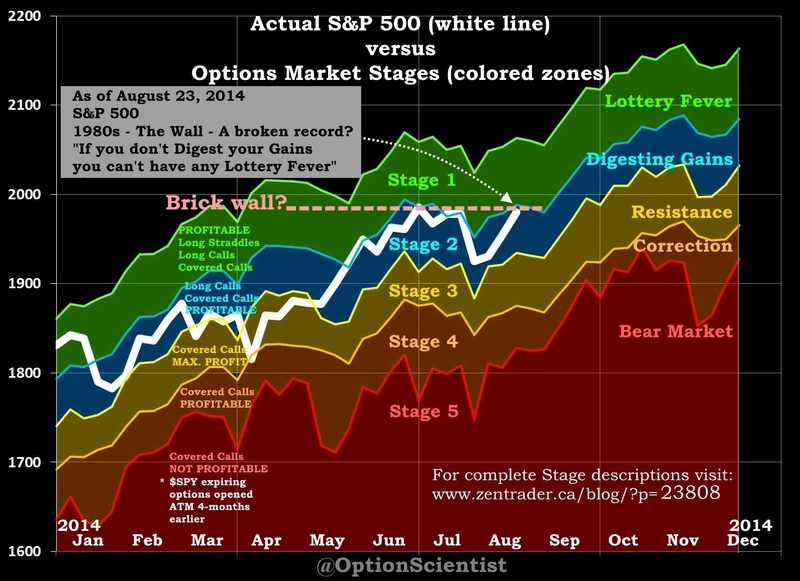 The stock market often gives off clues when it is making a shift to the lottery fever stage. These clues can be seen on a daily chart of the S&P 500 as a pattern resembling a cup and handle, bull flag or bull pennant, ascending triangle or wedge. In any of those patterns, the fact that stocks are changing hands is important to consider, especially the relative stability of the stock price throughout the process of the stock changing hands to extremely bullish traders such as those mentioned above. Any traders in those groups would likely prefer to hold stocks, even through a minor decline, in order to profit from the anticipated continuation of the uptrend. Thus, trading volume may tend to decrease as the stock changes hands. Conversely, formations such as a double-top, head and shoulders or broadening formation are often signs that stocks are not changing hands, but remaining in the hands of those who are not bullish enough to handle a lottery fever type of trading environment. 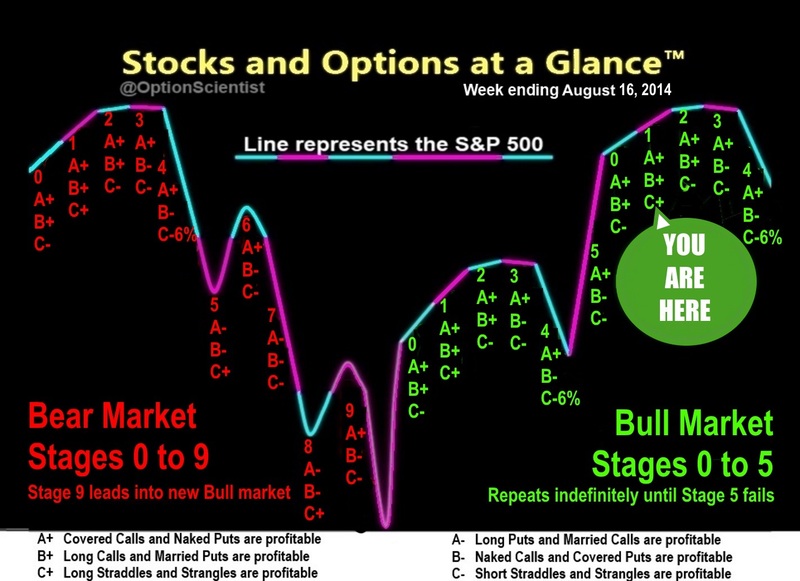 Lack of confidence may cause volume to increase as the stock does not change hands and those hands become impatient. 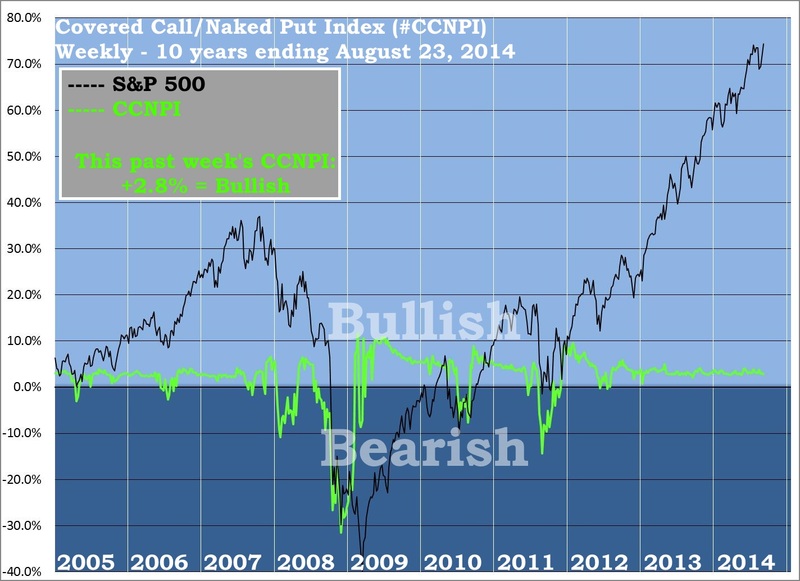 As long as the S&P remains above 1825 over the upcoming week, Covered Call trading (and Naked Put trading) will remain profitable, indicating that the Bulls retain control of the longer-term trend. Below S&P 1825 this week, Covered Calls and Naked Puts will not be profitable, and since such trades only produce losses in a Bear market, it would suggest the Bears were in control. As long as the S&P closes the upcoming week above 1932, Long Calls (and Married Puts) will remain profitable, suggesting the Bulls retain confidence and strength. 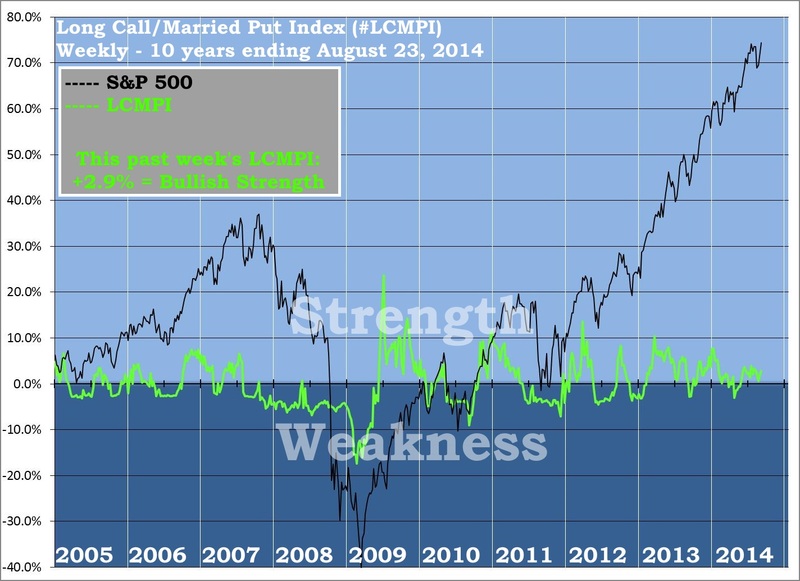 Below 1932, Long Calls and Married Puts will not be profitable, which would suggest a significant shift in sentiment, notably a loss of confidence by the Bulls. Confidence and strength show up as a “buy the dip” mentality, while a lack of confidence and strength produces a “sell the rip” sentiment that tends to set recent highs as brick-wall resistance, since each test of that high is perceived as a rip to be sold. The LSSI currently stands at +0.0%, which is normal, and indicative of a market that is neither in imminent need of correction nor in need of a major breakout from the trading range of the last few months. Positive values for the LSSI represent profits for Long Straddle option trades. Profits represent an unusual condition for Long Straddle trading, one of three unusual conditions that warrant attention. Long Straddle trading (and Long Strangle trading) will not be profitable during the upcoming week unless the S&P closes above 1985. Values above S&P 1985 would suggest a return to the recent euphoric “lottery fever” type of mentality that tends to lead to a rally for stock prices. Excessive Long Straddle trading profits (more than 4%) will not occur unless the S&P exceeds 2060 this week, which would suggest absurdity, or out-of-control “lottery fever” and widespread acceptance that stock prices have risen too far too fast for the rate to be sustainable, thus needing to correct in order to return to sustainability. 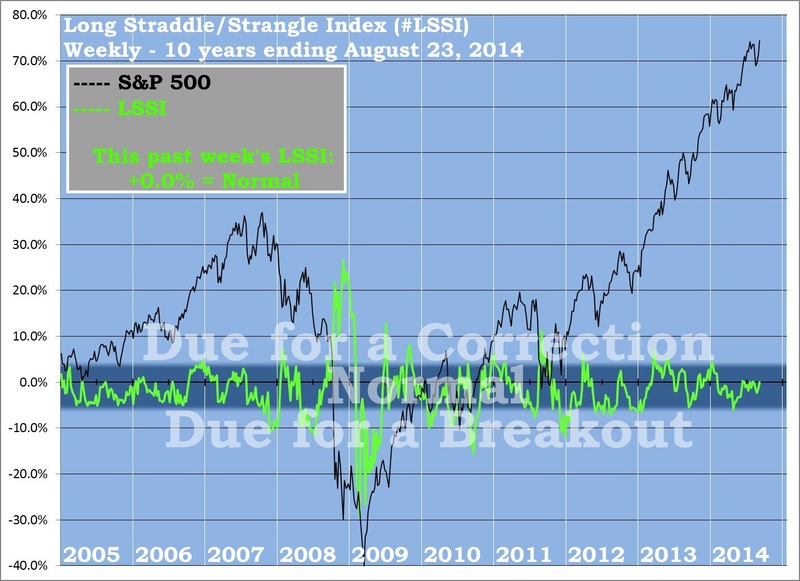 Excessive Long Straddle losses (more than 6%) will not occur unless the S&P falls to 1872 this week. Since excessive losses tend to coincide with a desire for traders to make stock prices break out, either higher or lower than the boundaries of their recent range, a break higher from 1872 would be a major bullish “buy the dip” signal, while a break below 1872 would signal a full-fledged Bull market correction was underway.